The Full Diet was created by Doctor Michael Snyder a board-certified general surgeon and leader in bariatric surgery. This program encourages you to reject the traditional diet mentality based on restriction, deprivation and extreme lifestyle changes. You will learn to work with your body so that you feel full and satisfied while eating less food. Doctor Snyder says that losing weight isn’t complex and you can learn everything you need to know in just one week. His program is presented as a seven-day guide involving a series of lifestyle challenges. For example one day you will learn how to structure the perfect meal. Another day you will plan your exercise routine for a week. By the end of seven days you will have put a variety of positive lifestyle factors in place. The primary concept of The Full Diet involves using the science of fullness to your advantage. Certain foods help you feel full and satisfied with less calories, so these form the foundation of the diet. Begin with the “Induction” phase for four-weeks then shift to the “Continuing Success” phase until you achieve your goal weight. Start with the “Continuing Success” phase. The first option involves the use of a lot of shakes and very restrictive so it may seem too limiting or overwhelming. If you choose the second option you will lose the same amount of weight but it will take longer. You will consume three small meals and two or three snacks daily. All snacks should contain 5-14 grams of protein and no more than 200 calories. You will also preload lunch and dinner, with a bulky snack, to prompt the sensation of fullness, which reduces your appetite. You are allowed two cheats each week but they must be planned 24 hours in advance. This helps to increase your awareness regarding your eating behaviors. It also allows you to indulge in your favorite treats in moderation, without feeling like you have broken the diet. Leafy green vegetables, tomato, cucumber, spinach, asparagus, broccoli, strawberries, apples, whole-wheat bread, brown rice, black beans, hummus, eggs, fish, chicken breast, turkey, salmon, tuna, shrimp, low-fat yogurt, low-fat cheese, almonds, low-fat peanut butter, low-fat salad dressing, avocado, Fullbars, coffee, water. Ideally you should exercise one hour a day for five days a week. Some people will need to gradually work up to this amount. You can start with activities like walking the dog or joining a yoga class. Later you can challenge yourself with more intense exercises like weight-training and running. 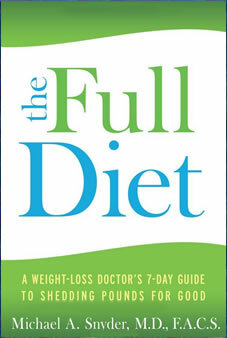 The Full Diet: A Weight Loss Doctor’s 7-Day Guide To Shedding Pounds For Good retails at $14.95. Includes one month of meal suggestions with recipes. Cheats make it easier to stick with the plan long-term. Includes advice on how to break a weight-loss plateau. Doesn’t require the elimination of any food. Frequent meals and snacks can reduce appetite. Suitable as a lifestyle approach to weight management. Induction phase is very restrictive. Requires time for meal planning and food preparation. Necessary to monitor calorie and protein content of snacks. The Full Diet does not include a structured exercise plan. Vegetarian and vegan meal options are limited. The Full Diet works by emphasizing foods that help you feel full and satisfied with less calories. It offers practical tools that don’t require an extreme lifestyle change in order for you to effectively lose weight.